Infrared satellite image (indicating cold cloud top temperatures) showing the location of TC Winston at 3.30pm Saturday 20th February 2016. Note the circle in centre of the TC showing an exceptionally clear ‘eye’ of the TC. This image is from the JMA, with MetService colour enhancements. TC Winston was located at 17.1S 179.7E about 50km southwest of Taveuni or about 175km northeast of Suva, the capital of Fiji at 1pm today (Saturday 20th February). The central pressure of the cyclone was estimated to be 917hPa, making it a Category 5 cyclone, and it is continuing to move in a westward direction. Winds close to the centre of the cyclone were estimated to be around 230km/h and with momentary wind gusts to 325km/h. Fiji Meteorological Service warns of periods of heavy rain and squally thunderstorms, damaging heavy swells and flooding, including sea flooding of low lying areas. 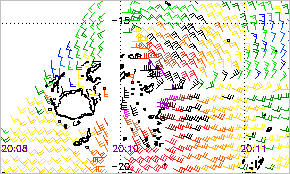 Rapidscat Wind observations at 12.12pm today (Saturday) at 12.5km resolution. Windbarbs show wind speed in knots (not km/h). The Fiji MetService Website is currently very slow to load, probably due to the high numbers of people trying to get the latest information. Here is the latest information from their Special Weather Bulletin that was issued at 1pm today. A hurricane warning remains in force for Vanua Levu, Taveuni and the nearby smaller islands, northern half of Viti Levu, Ovalau, Gau, Batiki, Nairai, Koro, Vanuabalavu, Yacata, Mago, Cicia, Tuvuca, Nayau and Vanuavatu. A storm warning remains in force for Lakeba, Oneata, Moce, Komo,Namuka, Ogea, Moala, southern half of Viti Levu,Yasawa and Mamanuca group. Expect very destructive hurricane force winds with average speed of 230km/h and momentary gust to 325km/h. Heavy rain and squally Thunderstorms. Damaging heavy swells. Flooding including with sea Flooding of low lying areas. Tropical Cyclone (TC) Winston was named by RSMC Nadi at 1pm on February 11th, 8 days ago, located to the east of Vanuatu. Since then, TC Winston has tracked southeast before turn northeast, then westward and is now over Fiji. Over the next 24 hours TC Winston is expected to remain Category 5 and to continue to move westward, predicted to be near 17.3S 176.7E at 1pm tomorrow (Sunday 21st February). The effects of Severe Tropical Cyclone Winston are expected to impact both of the main islands of Fiji, as well as the smaller outer islands. These are extreme conditions and we hope the residents of these islands will be okay. There are currently no direct impacts expected for New Zealand in the next few days as TC Winston moves westward and then takes a more southerly track. Most global weather models expect the system to track southwest and then northwest before weakening near the Coral Sea, but there are also some models which have the track moving further south. However, it is too early to give an accurate forecast of any impacts to New Zealand in the longer term. With tropical cyclones there is always some uncertainly associated with the tracks they will take, so we advise people in New Zealand and planning travel to the Pacific to keep up to date with the latest forecasts at www.MetService.com. MetService meteorologists are monitoring this tropical cyclone and working closely with Fiji Meteorological Service. If communications go down in Fiji due to this tropical cyclone, MetService are on standby to product the official bulletins and Advisors for Tropical Cyclone Winston. The World Meteorological Organization (WMO) Tropical Cyclone Programme has been established to help emergency managers and the public prepare for tropical cyclones and minimise the loss of life and damage they can cause. Under this programme, MetService is designated as the Wellington Tropical Cyclone Warning Centre (TCWC) and, together with Regional Specialised Meteorological Centre (RSMC) Nadi , is responsible for official warnings and advisories for tropical cyclones in the South Pacific. Any severe weather effects for New Zealand caused by tropical cyclones will be included in Severe Weather Warnings, Watches and Outlooks, as well as marine warnings and forecasts. http://metservice.com/warnings/severe-weather-warnings. As always, you can keep up to date with the latest forecasts and warnings at metservice.com as well as updates on the MetService Blog, Twitter and Facebook.